In 2017, the Bitcoin price shot up. The crypto boom was in its prime and BTC, in particular, saw a rise, especially in the second half of December. When this happened, there was a rush to buy the cryptocurrency; then there was a crash. 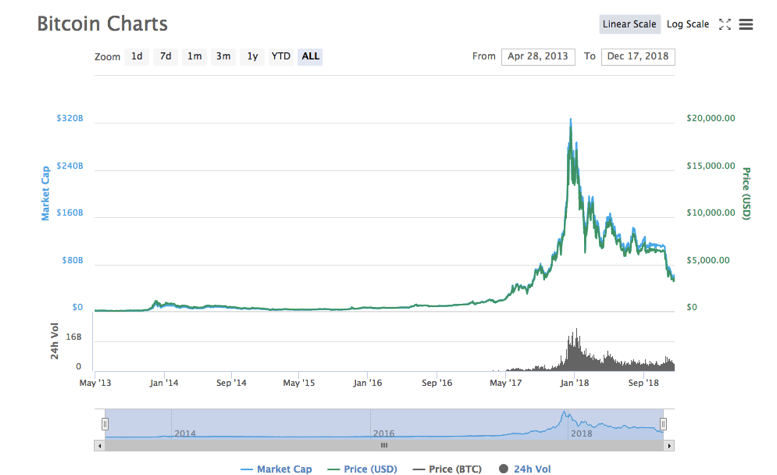 One year later, the BTC price is nowhere near where it was in December 2017. However, even though we have more Bitcoin bears emerging from the forest, there is some indication that BTC is the same asset and will continue to provide investors with the same shots. In December of 2017, Bitcoin price was flying and almost reached a whopping $20,000. Fast forward a year, things are looking a little different. At the time of writing, the BTC price is sitting at $3,587.05. Despite the visible price changes in Bitcoin, the crypto market remains divided. There are bears, like Erik Finman, and there are bulls, like Tom Lee, who has maintained his end-of-year outlook, despite the falling market. This week, MarketWatch published an interview with Erik Finman, a teenage Bitcoin millionaire. Going from a 12-year-old who purchased Bitcoin with $1,000 from his grandmother, Finman is now bearish on the digital currency. >> EOS, Litecoin (LTC), and Cardano (ADA) Get a Boost! Not everyone feels this way, though. Tom Lee, a long-standing crypto bull, announced back in November that he still believes the Bitcoin price will reach $15,000 by the end of 2018. Meanwhile, Matti Greenspan, an eToro senior analyst, thinks Bitcoin may make a comeback. Greenspan also believes the digital currency’s price fluctuations over the last year have no reflection on BTC’s long-term interest. Both the Bitcoin bulls and bears make valid points. Just like with other markets, however, only time will tell the direction that Bitcoin price takes in 2019.